As an industry-leading wholesale needlepoint distributor, Unique NZ Designs has been providing retail establishments with high-quality needlepoint kits and handpainted canvases since 2003. Over ten years later, Unique NZ Design owners continue to share their contagious enthusiasm for fun, contemporary, whimsical style with the needle arts community. In 2018, Unique NZ Designs was purchased by PLD Designs, Inc. continuing the tradition of contemporary needlepoint. Their mission is to provide customers with an up-to-date inventory of unique, cosmopolitan needlepoint products, along with the best order fulfillment and personalized service the industry has to offer. Call us today on 877 722 8463, or 626 483 0951, or order online, (you must be a needlepoint retailer to order from this website. Contact us for information about how to access the online wholesale order portal). 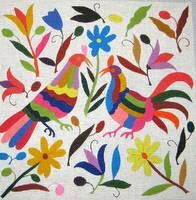 Mexican Embroidery: One of the many fabulous handpainted needlepoint canvases in our stable of contemporary needlepoint designs.